Divemaster 1 is a popular Thai liveaboard (that’s why the prices are in Thai baht) that runs trips to Layang Layang from March to June each year. It is the only liveaboard that also dives the wrecks at Labuan. These popular trips book out quickly and space is limited to 20 divers per trip. 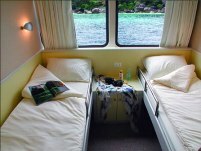 There is one Master double bed cabin with en-suite, 8 standard twin bed cabins and 2 standard single cabins. The standard cabins share 7 bathrooms. Each room has it’s own adjustable air con. 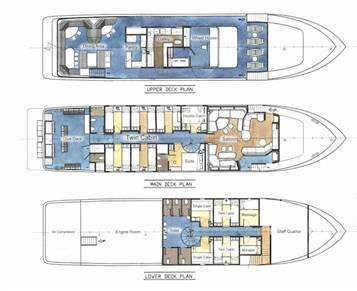 There is ample space on board with both shaded areas and a sundeck. The large saloon has full multi media facilities. EPIRB, Radar, GPS,Depth Sounder, AIS, VHF, SSB Radio, Sat phone. Day 1: Welcome on board Saturday evening, followed by dinner and Divemaster’s briefing. Blue Water Wreck, Cruise to Layang Layang (cruising time 15 hrs.). Day 3: Report to Layang Layang Navy Base. 4 dives at Layang Layang. Day 4: 4 dives at Spratly Islands (Dallas Reef and Mariveles Reef). Day 5: 4 dives at Spratly Islands (Dallas Reef) and Layang Layang. Day 6: 2 dives at Layang Layang and cruise to Labuan. Day 7: 06:30 A.M. Breakfast. 07:00 A.M. Transfer to Airport. Included in the above prices: Airport transfer from Labuan airport to boat, all meals, towels, drinking water and hot beverages, snacks and fruits, tanks, weight belt, dive guide. Note: There is no equipment rental available on Divemaster 1. all divers must have their own dive equipment. Getting to Labuan: Malaysia Airlines and Air asia fly daily from Kuala Lumpur, Kota Kinabalu, Miri and Kuching to Labuan. Kuala Lumpur and Kota Kinabalu are international gateways, which connect Labuan to major cities around the world.